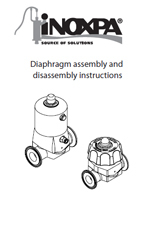 The diaphragm provides the body seal as well as the seat seal. 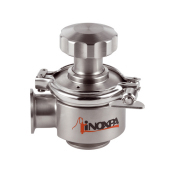 There are no paths to the outside environment and, as such, the valve is suitable for aseptic processes. 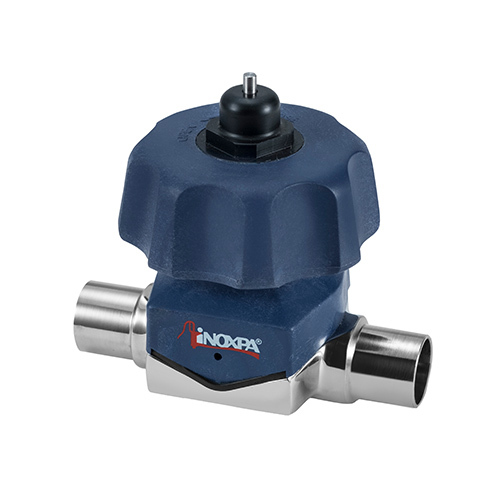 When the valve is being closed, a pressure pad which supports the diaphragm moves towards the sealing face on the body. As the pressure plate moves, the diaphragm flexes and is forced down onto the seat area in the centre of the body, thus, closing off the flow path through the body.The inter-relationship of body to the pressure plate prevents over compression of the diaphragm. 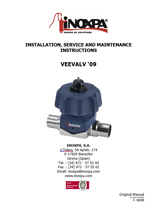 The valve can be actuated either manually or pneumatically and controlled by control tops and solenoid valves. Straight through flow path. High Kv factor. 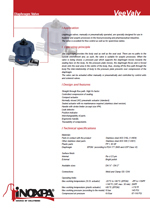 Normally closed (NC) pneumatic actuator (standard). Sealed actuator with no maintenance required (stainless steel version). Handle with stroke limiter (except size Nº4). Available sizes DN ¼" - DN 2"
Handle: stainless steel or plastic. Bonnet: stainless steel or plastic. Normally open (NO) double-acting pneumatic actuator. Valve with controller and positioner.